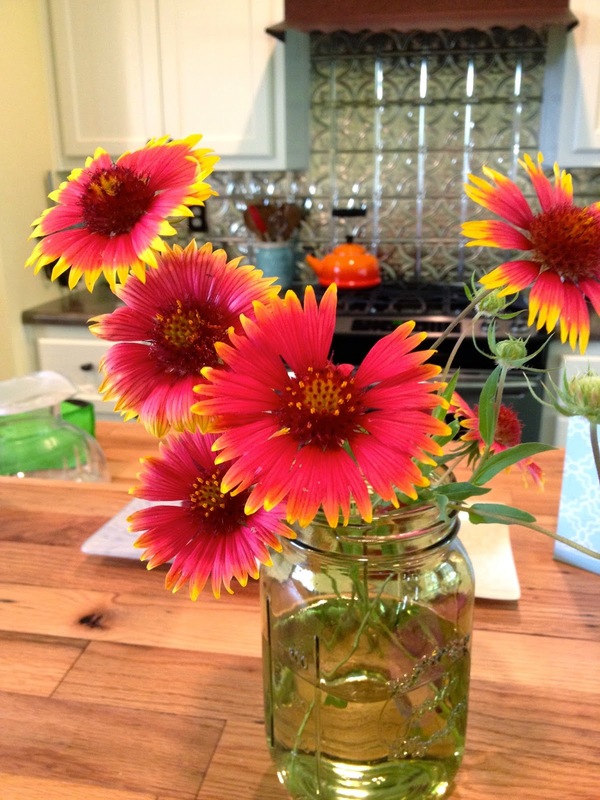 You might call it a redneck delicacy ... for if you spend much time bent over in the May sunshine picking them your neck most certainly could end up crimson. And the pasture around our barndominium home is prickly with the thorny vines of them. Their simple white blossoms alerted us to their presence as winter withdrew, filling the air with the sweet promise of childhood memories. My parents used to take us to pick wild dewberries on oil leases my dad knew weren't being sprayed with poisons, and where no one was going to miss them. It felt like we spent all day in the sun picking them, though I don't remember any of us complaining. 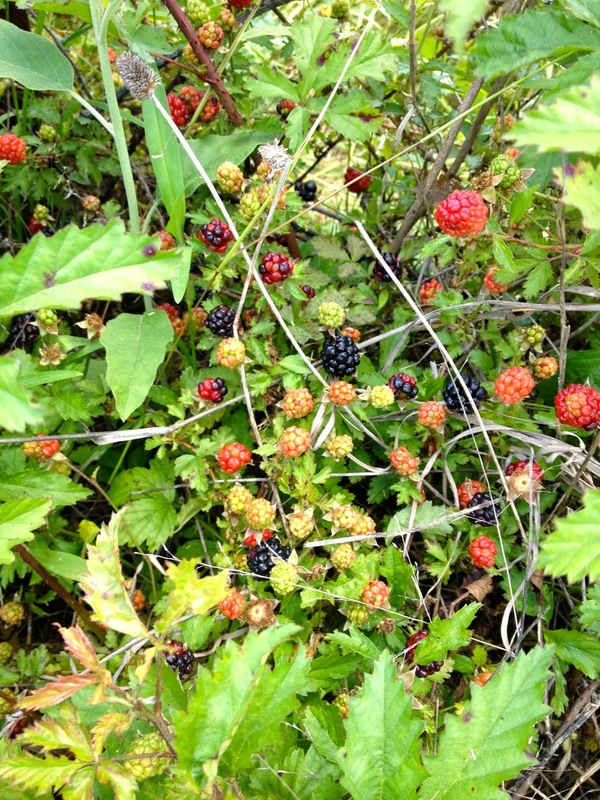 When ripe a dewberry is dark maroon ... but it sure adds a nice kick to throw in a few red ones. Sunday, after church, while the girls were both napping, Tim and I took turns going out to pick dewberries. They aren't easy to get to ... the pasture is overgrown (it almost seems it has to be for this particular fruit to be happy) and the vines are covered in small thorns. The berries themselves are close to the ground, and the ripest, most juicy ones always seem to be in the shadows. Never in my life have I been warned by so many people to look out for snakes. As I started figuring out how best to go about wending my way through the thicket without crushing them, but also without shredding my skin, memory came flooding back and I was close to 10 years old again. Soon I was using the plastic two gallon pail to brush the higher growth aside, thorns whispering over my bucket instead of my skin. Anywhere I spotted red berries, I knew the plump ripe nearly black ones were lurking in the shade beneath the unremarkable leaves. As the bottom of the bucket filled I moved to a different patch. Sweat collected between my shoulders and ran in a salty tickle down my spine. Ripe heads of wild grasses nodded in a not-quite-cool breeze as I rustled through growth nearly as tall as myself. 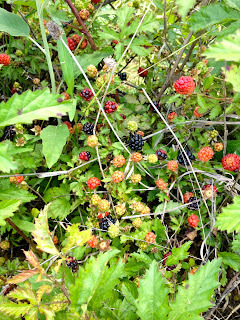 This patch was farther along with the majority of the berries ready to be picked. Every time I thought I should go let Tim know and check on the girls I saw another group of berries begging to be plucked from the increasingly hot sun. "Well, just one more..." I'd agree. In the end I picked 1 lb 1 oz in about 45 minutes and Tim got 1 lb 1/8 oz in just over that (not bad for a first timer). But nothing felt as young and carefree as that first taste.